This week's quilt pic is of quilted placemats. Those count, right? The fabric is Lazy Day from Riley Blake and these were bits left over from another quilt that I can't show you... because it isn't bound yet... and because it won't be delivered to the special birthday girl for another six weeks. I bound the placemats in some plain red fabric. Done! and Delivered! Enjoy your placemats, Mom! Have you ever tried to count the number of projects in your sewing room? I gave up at 100, and I wasn't half done yet! How can I clean a room with so many undone projects in it? I could finish a bunch of projects, but then I have no chance of a clean sewing room in this lifetime. I could buy pretty boxes for each project, but then I'd spend more time arranging than quilting and that would make me sad. Also, I'd rather spend that project box money on fabric! I could admit defeat and get rid of some fabric and projects. I have given away a lot of books and patterns to my quilt guild. I've been slowly gifting fabric to my local library's quilt group; they have no storage and I don't want to overwhelm them. I love this apron pattern and have made several of them for myself and for gifts. It was clear after at least 4 years, though, that I was never going to make this apron in the Daiwabo fabrics I had selected. I gave the pattern away at a recent guild meeting and I put the precious Daiwabo fabric back in the box with the rest of the Daiwabo fabrics. I didn't clear up much space in my sewing room (only one small pattern is missing) but I have one less project on my "I really should finish up all of my UFOs" list. My brain is happier. I'll give you $1 if you can tell me what this was supposed to be! For now, this is on my cutting table where I can see it and hopefully remember what I planned to make from it. If I can't remember, I'll either make something else or put the fabric back into my stash. Welcome to my too-full sewing room and too-full brain! Grab a pen now and mark June 8 - 11, 2016 on your calendar. That is when next year's Handi Quilter Academy is scheduled and you don't want to miss it! I was so busy in the classrooms that I didn't have much time for class photos. Sorry! Come next year and take a lot of photos for me, ok? Never argue with a woman who can use a pallet jack! Thanks for a great event, HandiQuilter. I can't wait to come back again next year! Mischief Managed: FabuLux Thread Line Announced! There have a few silent stretches on my blog recently. I am hard at work, trust me on this, but it is usually work that I can't talk about. I'm always relieved when a project reaches the point that I can share it. I hate keeping secrets!!! Last week I taught at Handi Quilter Academy in Layton, Utah. Andrew from WonderFil announced a new thread line called FabuLux. I was honored to select the colors for this thread line. It was So. Much. Fun!!! FabuLux is a 40 weight three-ply trilobal polyester thread. It stitches beautifully! The full line of thread will be released in the next few months. Subscribe to my newsletter if you want to follow the release of the thread line. I promise lots of eye candy! Good morning from Salt Lake City! I am here, excitedly getting ready for my first day of classes at Handi Quilter Academy. This is one of my favorite teaching experiences and one I make sure not to miss! This year, however, Delta was trying to make me to miss my first day of classes. I scheduled my flights and was ready to go. I didn't like the 2:30 am wake up, but it was a plan... until Delta cancelled my flight and rescheduled it for 24 hours later. I wouldn't get to my first day of classes (starting at 9:00 am) until about 2-3pm. NOT GOOD! Plan B wasn't ideal, but it at least got me there on the right day. It also avoided the dreaded 2:30 wake up and had me flying from a closer airport. Plan B went badly from the start. The traffic on the interstate was standing still. I am so grateful that I was already across the bridge when that happened. In NY we live and die by our bridges. I was able to get off the highway and wander around until I got to the airport. I was a little later than I wanted to be but still in plenty of time. I soon discovered that my flight was delayed due to a mechanical problem back in Detroit. So I sat. And waited. And waited some more. I had a great nap for the first part of that flight! There also may have been a cookie involved, but all evidence is lost. What my fortune didn't tell me was that I'd get a first class upgrade for my next flight. Comfy seat! WooHoo!!! I read a book and made some notes for an upcoming project, all from my lovely first class seat. In summary: I had a little travel stress for about 24 hours, but once the first flight took off I had an EXCELLENT trip. Why didn't I plan it this way in the first place??? I made this one from my scraps. I pulled out a bunch of rustic colored Cuties that I had cut from fabrics left from other quilts and found sixteen that worked well together. I pulled out a huge chunk of cream fabric from my stash as well as a dark brown chunk for the border. This quilt pieces very quickly but I decided to do a lot of quilting on it. A Lot. This quilting took forever and boy does it look good! I recently received a box in the mail. It was from Meander Publishing, publishers of Modern Quilts Unlimited. They sent back my quilt that was published in the Spring 2015 issue. I made 'Dedication' to fit on my dining room table and now the quilt is in it's forever home. Back when we first bought this house, my dining room was empty of all furniture and my husband bumped his head on the chandelier every time he walked from the kitchen to the living room. I traded my quilting services for someone's old and unwanted dining room set just to protect poor hubby's head. I replaced that old chandelier several years ago with a modern black and white one, but now I am in desperate need of new chairs. Black ones to match the quilt, naturally. At Quilt Market in May, I met a new friend, Zoë. Zoë is helping me make sure you know all about my New! Exciting! Top-secret! projects the very second they are no longer top-secret. She is awesomely talented and I'm so excited to be working with her. Everyone, say "hi" to Zoe! Quilt of the Week -- a PLAY mash-up! This post contains affiliate links, which help me keep my blog up and running. Thanks for the support! Do y'all know Victoria Findlay Wolfe? If not, you are missing out. I am inspired by her, in awe of her talent, jealous of her energy, and privileged to call her a friend. 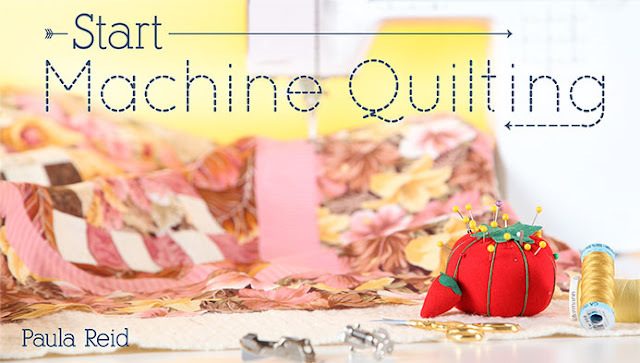 She has a fantastic book called 15 Minutes of Play: Improvisational Quilts. I cut my scrap fabrics into usable chunks (fat eighths, 5-inch squares, 2 1/2 inch strips, 1 1/2 inch strips) and everything that is left over gets thrown into a bucket. I pull out that bucket and 15 Minutes of Play when I just want to have fun with fabric. After several sessions of "fun", I had nine big blocks of made fabric, but I wasn't sure what to do with them. Enter Small Pieces, Spectacular Quilts: Patterns Inspired by Antique Quilts by Mary Elizabeth Kinch and Biz Storms. I have read this book so much that the cover is curled and I had to hold it down for a photo. I received a copy of this book at International Quilt Festival in Houston last year and was instantly mesmerized. One quilt, in particular, rocked my world. I loved its mustard color, its wide sashings and border, and the quilting... oh the quilting! It is wavy, wiggly horizontal-ish lines. I decided to take my blocks that I made using Victoria's book and set them like the antique quilt, but change the color of the background and the orientation of the quilting. The quilting thread is actually bright, bright, bright yellow. Some day I'll learn to take proper photographs, but that day isn't today. Sorry! I don't really have a name for this quilt yet. Maybe "Mash-up"? Any suggestions? I was hand-binding this quilt on vacation last week and some family members fell in love with the backing fabric. I excitedly turned the quilt around to show the front and received a "but that pumpkin fabric is really pretty!" comment in response. I love these family members. They absolutely crack me up and will likely receive some potholders made with this pumpkin fabric later in the year. I adore the front of this quilt and others adore the back. All is well! Have you ever taken inspiration from many sources and mashed them all into one quilt? Post your results on my Facebook page. Confession: I am frugal. I save lots of little bits of things... like batting. I kept these bags in the hallway outside of the studio as I was cleaning and they kept getting fuller, and Fuller and FULLER!!! I think that I can find space for them in my studio finally! That's a double score: organized batting scraps waiting for the next project and a clear hallway. I think if I keep at this cleaning thing, I'll have a presentable studio in, say.... 7 or 8 years? Did you see that Netflix released a ten-episode season of Marco Polo? Did you know that I watched the entire series in four days? Did you know that I really just listened to most of it while quilting, which was shame since this epic had beautiful scenes and was wonderfully filmed? Can you believe that I designed a quilt pattern based on something I saw on the screen when I glanced up from quilting? Did you know that I'll be tortured waiting for Netflix to film another season? Did you watch Marco Polo? Did you know I'm now wondering what to watch next? This post may contain affiliate links, which help me keep my blog up and running. Thanks for the support! I'm sad. So, so sad. I was on a beach vacation and I'm sad to be home. I'm taking a page out of Maria Von Trapp's book and thinking of "a few of my favorite things" to make me feel less sad. My favorite thing from vacation was something that you might not expect: my new UPF 50 Swim Tees. I was born to be a finalist in the "whitest person on earth" contest. The sun and I have never been friends and some medical stuff in recent years has made me unable to handle the sun at all. Does that make me an official vampire? I obviously mean the Anne Rice variety rather than the sparkly Twilight kind. The shirts are like thin bathing suit material. The fabric wasn't hot other than it was 90*F outside. I didn't wear sunscreen at all. I still limited my time in the sun and wore a big ugly hat. The shirts are hand-wash and drip dry. They almost dry overnight, but not quite. Did I miss any questions? If you hide from the sun like I do, you know what a miracle this was. Normally, I would have viewed them from the shade of a distant tree, but these photos show just how close I was able to get to the cats. They were all rescued and are very well cared for. It was a treat to see them and how they interacted with their handlers. My next test of the magical shirts will be a bicycle ride, hopefully this weekend. Do you read Paula Reid's quilting blog? No? Well go and read it now! And sign up to read it regularly because Paula is a gem! While I was on vacation last week, Paula published a post written by ME! 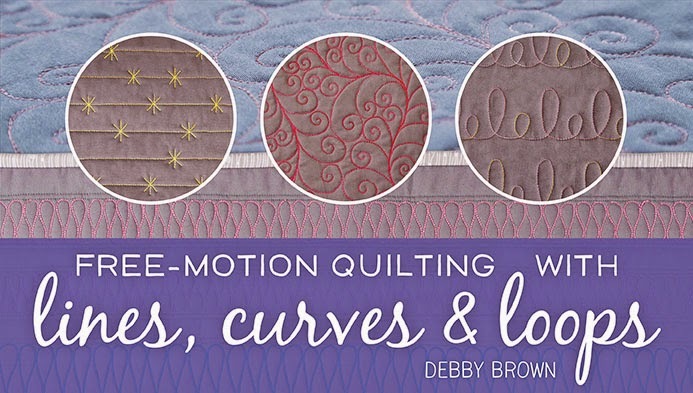 I write about a shameful secret in that has been locked in my quilting closet for years. Check it out. 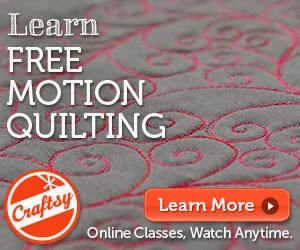 You should also check out Paula's Craftsy class. Paula really gives the nuts and bolts of quilting in this class, like basting, marking, and moving the fabric. I know that you will love Paula as much as I do! Well, the dark green thread looked great on the black fabrics, as well as the bright fabrics and even the border!